The Magazine of the Week is the first issue, Fall 1949, of the Magazine of Fantasy & Science Fiction, cover by Bill Stone. 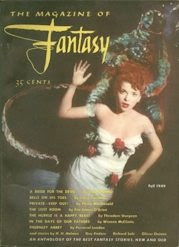 This initial issue bore the title "Magazine of Fantasy," but the name was expanded by the second issue and has remained "Fantasy & Science Fiction" ever since. F&SF is still going strong, having published over 650 issues to date. 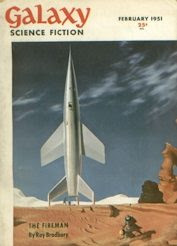 Under the direction of editors Anthony Boucher and J. Francis McComas, F&SF quickly emerged as one of the leading magazines in the field in the 1950's. However, this initial issue was rather unimpressive, filled with second-tier writers, reprints, and a pseudonymous story by Boucher. The issue's saving grace was a story by Theodore Sturgeon, "The Hurkle Is a Happy Beast," with its bizarre opening line, "This is Earth, and it once was horrible with wars, and murders, and young love in the spring." Next week we will look to honor a Hugo Award winner, perhaps even one published in the Magazine of Fantasy & Science Fiction. The Magazine of the Week is the February 1951 issue of Galaxy magazine, with cover story "The Fireman" by Ray Bradbury, the original story which Bradbury later expanded into the classic Fahrenheit 451. The cover art -- totally unrelated to "The Fireman" even though that is the only story named on the cover -- is by Chesley Bonestell. This was the fifth issue of Galaxy magazine, and it boasts a remarkable table of contents. In addition to the first version of Bradbury's Fahrenheit 451, this issue contains part two of a serialized novel by Isaac Asimov later published under the title The Stars, Like Dust, as well as stories by major authors Clifford D. Simak, Lester del Rey, and Frank M. Robinson. Galaxy was one of dozens of science fiction digest magazines to enter the marketplace as the pulps disappeared in the late 1940's and 1950's. Under the direction of editor Horace Gold, Galaxy quickly emerged as one of two digests that could consistently challenge market leader Astounding in quality. (Next week's magazine of the week will be the very first issue of the other.) Published from 1950 to 1980, Galaxy de-emphasized high-tech gadgetry in favor of stories like Fahrenheit 451 that addressed social issues. This change of focus was instrumental to the growth of the SF genre. The Book of the Week is a signed first printing, paperback original of Fahrenheit 451 by Ray Bradbury, cover art by Joe Mugnani. This is the most significant of all the landmark science fiction novels first published in 1953, and accordingly in 2004 it won a "Retro-Hugo," recognizing classic works of 1953 that might have won Hugo Awards if only they had been presented that year. This original paperback edition of Fahrenheit 451 was issued a few weeks before the extremely rare first hardcover edition and the even more rare asbestos edition (no kidding). Since the publisher, Ballantine Books, did not know that Fahrenheit 451 would end up an all-time classic, and since the novel is rather short, all of the original editions contain two additional short stories to give readers their money's worth. Ray Bradbury signed my copy at last year's World Science Fiction Convention, which gives you an idea of the caliber of guest the Worldcon attracts, and hopefully will attract when the Worldcon comes to Denver in 2008. Fahrenheit 451, set in a decadent future in which books are forbidden, is among the most famous dystopias ever written, standing with such classics as 1984 and Brave New World. While Fahrenheit 451 was first published in 1953, a shorter version of the story first appeared in 1951. You will see that original edition of the tale next week. 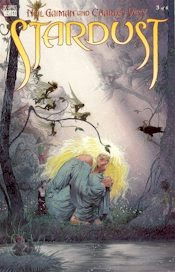 Continuing with the topic of Stardust, this item from my bookshelf is one of the graphic novels of Stardust, subtitled Being A Romance Within the Realms of Faerie, with story by Neil Gaiman and pictures by Charles Vess. This is book 3 of 4 in the series. It was published in 1998 by DC Comics Vertigo. It contains 48 pages, and although it's comic book sized, it has much more text than a comic book. It's basically a story accompanied by color illustrations. 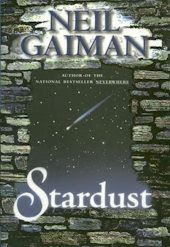 The Book of the Week is Stardust by Neil Gaiman. We will finish our recap of the classics of science fiction from 1953 next week, but I saw that the film version of Stardust opens this week, so I couldn't miss the chance to show off my signed hardcover first edition (preceded by the original illustrated version serialized in four comic books), cover design by Russell Gordon. Stardust is the charming story of Tristran Thorn's quest to recover a fallen star to impress a lady, a task rendered more difficult by the star's reluctance to cooperate. (For more, see the book group's page on Stardust ) Neil Gaiman first became popular writing graphic novels (i.e., comic books), notably the landmark Sandman series. He has since proven himself an excellent prose writer as well, winning Hugo Awards for Best Novel for American Gods and Best Novella for Coraline (an animated film version of which is also in production), and reaching #1 on the New York Times bestseller list with Anansi Boys (see my review of Anansi Boys ). His short story "How to Talk to Girls at Parties" is a current Hugo finalist. One should never expect much when Hollywood adapts written science fiction and fantasy, but the strong cast (Charlie Cox as Tristran, Claire Danes as the star, Peter O'Toole as the king, Michelle Pfeiffer as the witch, and Robert DeNiro as the pirate Captain Shakespeare) gives hope that Stardust will add to the recent trend of Hollywood treating SF/F with a bit more respect. The Book of the Week is the first paperback printing of The Caves of Steel by Isaac Asimov, cover art by Robert Schulz, another all-time classic of science fiction first published in 1953. As fine a book as The Caves of Steel was, there was an even more seminal science fiction novel that first appeared in 1953, as we will see next week.